couch surfing | La même lune. Paris, non, je ne regrette rien. What best way to start a post about Paris than with a song by lovely Piaf? My stay in Paris was extremely short, but memorable. I went to Finland in July, to visit my cousin, and I had bought tickets to Paris before hand. I only stayed there for 5 days, and before getting there, I was upset it wasn’t a lot of time and maybe I wouldn’t be able to enjoy the trip. Oh, man, was I wrong. Paris is worth visiting, even if you have just a couple of days. Everything they say about it is true. It’s a damn romantic city, it has amazing food, beautiful places, great music. I will have to disagree with ONE thing though. And I will explain why. People kept telling me that French people were rude. I’m not sure if I didn’t took that advice into consideration because people tend to say that about my city (Curitiba) or because I just don’t like pre-judgements. I like checking it out myself. I went to Paris with the most gigantic smile on my face. I was happy to be there, I was enjoying being with myself. In the airport, I bought some food because I hadn’t had any breakfast and I was taking a bit too long to choose what I wanted to eat. This FRENCH lady in line, smiled at me, with absolutely no hurry or any signs of impatience, and told me that the fruit juice was really tasty and the pan au chocolat was delightful. She realized I wasn’t from there and chose to help. There. My first ever impression about French people. Not bad, huh? Actually, I’m not being fair. I take french classes and my teacher is from France and he is the nicest person, really sweet and patient. Not at all rude. And then, the lady at the airport. I thanked her, took my food,sat down, called my mom on Skype and said: Mom, I’m in Paris. This was the first time I tried Couch Surfing. When I was in Finland I sent messages to a bunch of people and asked if I could crash on their couch for a few days. I got a few replies, but there was this one guy with a lot of references. So I messaged him back, we talked a lot, for a few days, to get to know each other a bit better before I went to his house. Sam was his name. 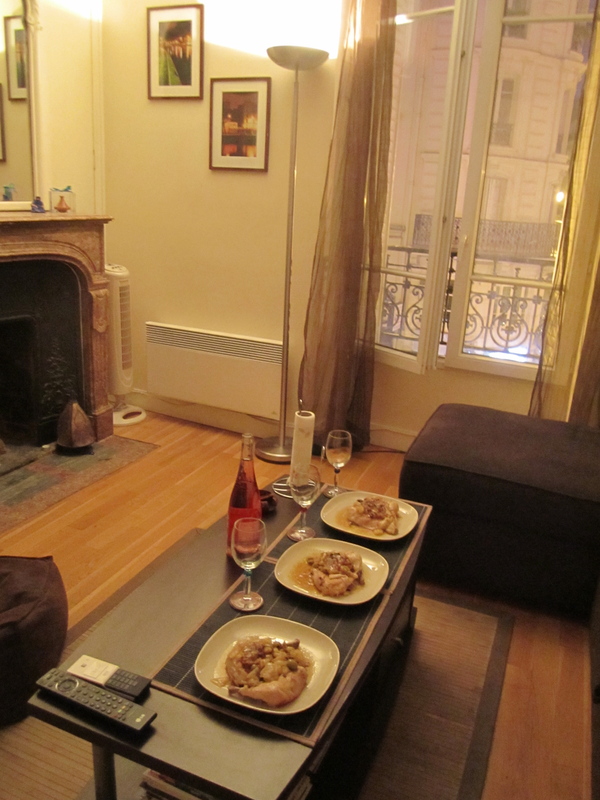 Sam gave me directions from the airport to Gare du Nord, to his house. I thought I was going to get lost, actually, I had no doubt about it. But I followed his instructions, asked people if I was going the right way, and I got to Gare du Nord pretty easily. Then, from there, I had to carry my…quite big….suitcase to Sam’s house. Then I got off the train and realized that there was no elevator or escalator. ”Ok, ready to carry this huge thing up the stairs?” I thought. That’s when two guys gently offered themselves to help me carry it upstairs. I was so relieved! On the way to my host’s house, I took time to look around. The area I would stay at, was mostly a immigrants area. A lot of indians, middle-eastern people whistling and asking if they could carry my luggage for me. It was funny. Following the directions from my iPod, I got to his house, but could not type in the numbers to open the gate. I think Sam saw me from upstairs and ran to help me. His apartment was a very pleasant little place, with two rooms and a nice living room, with a tiny balcony. So french. I noticed that no matter what time you went to the balcony, you could always see people in the other buildings smoking on their balconies. The weather was really warm when I was there, which I love, by the way. There we went, got some beers, sat down and talked for an hour about our travels, favorite places, stories, etc. Then we decided to go ride the Paris bikes. They have a pretty good bike sharing system. A resurgence in bike sharing programs is attributed by many to the launching in 2007 of Paris’s Vélib’, a network of 20,000 specially designed bicycles distributed among 1450 stations throughout Paris. Vélib’, inspired by Lyon’s seminal Vélo’v project, is now considered the second largest bike sharing system of its kind in the world. That was absolutely the best idea ever. We rode our bikes all over Paris. For hours. Such a great feeling. 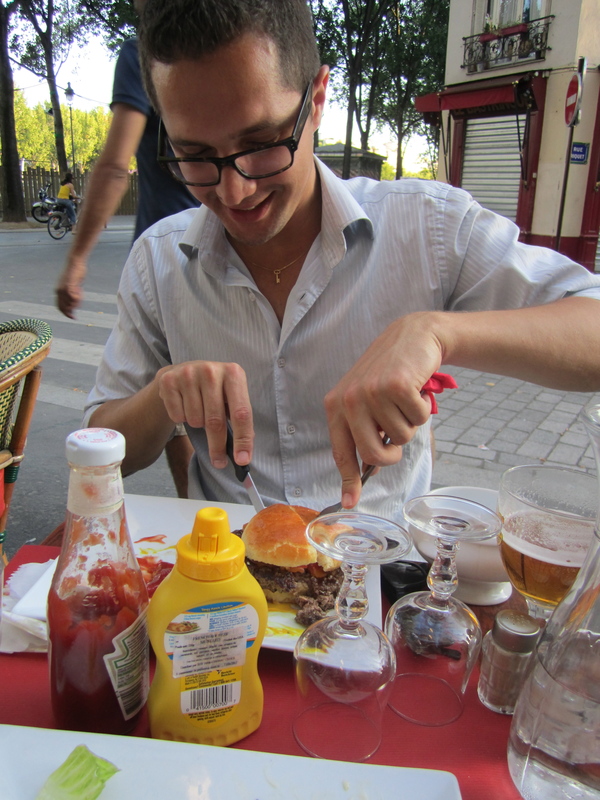 We stopped at a bistro to have some…burgers! Yes. And then Sam ate them with a fork and a knife and I found that hysterical for some reason. Then we continued our ride. 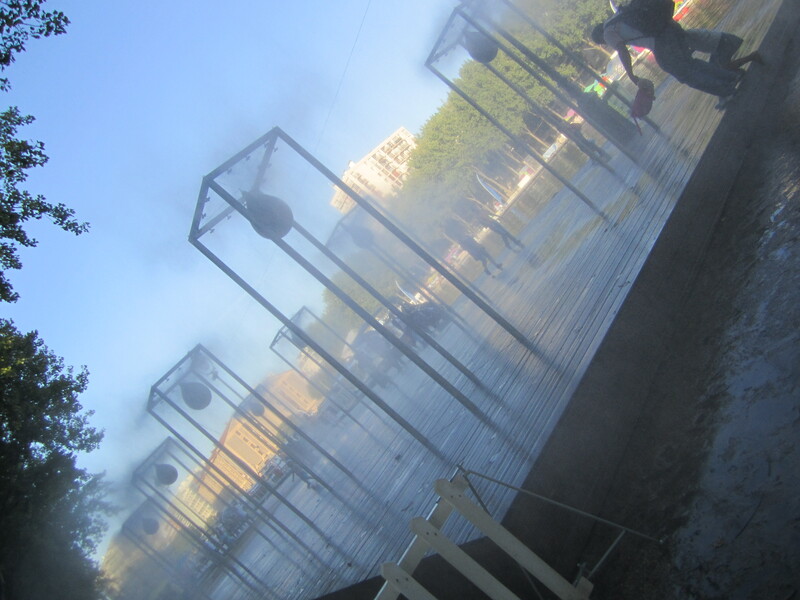 It was summer, so through out the city, there were these water spraying ballon things to refresh everyone. In the days that followed, Sam took me to a few other nice places around town. We talked a lot. 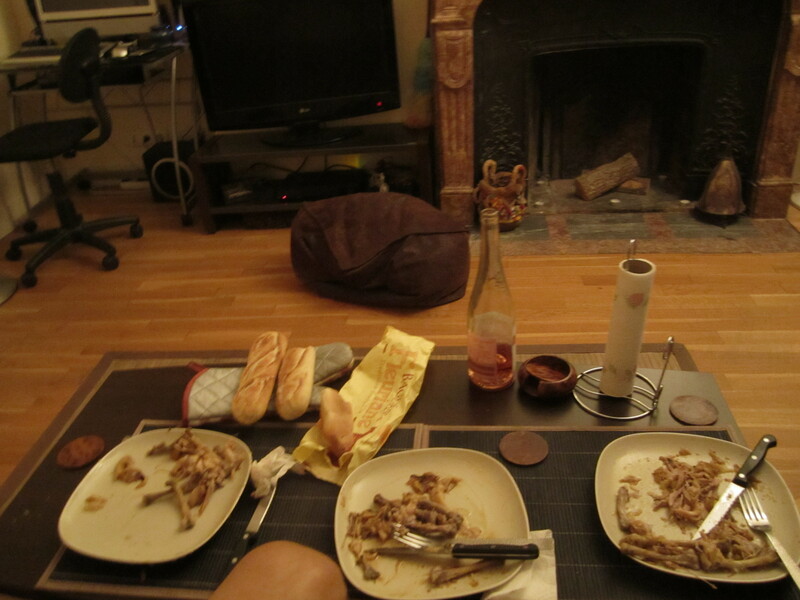 I was too shy to practice my french with him, but when I was alone and had to order something, I did pretty well. My cousin, Ana, who is basically my sister, was living in Europe at that time and she was going to be in Paris when I was there. So we decided to meet. It was so great that we were there, together. We are very close, always have been. I live a couple blocks away from her house, in Curitiba. We were always together when kids, we even looked a lot like each other. But meeting in Paris was so special. We stopped by little shops, had amazing ice cream, walked around, went into gorgeous churches, talked, talked, talked. She then met my couch surfer for a few minutes, only, though. Then she took her train back to Germany, where she was living. 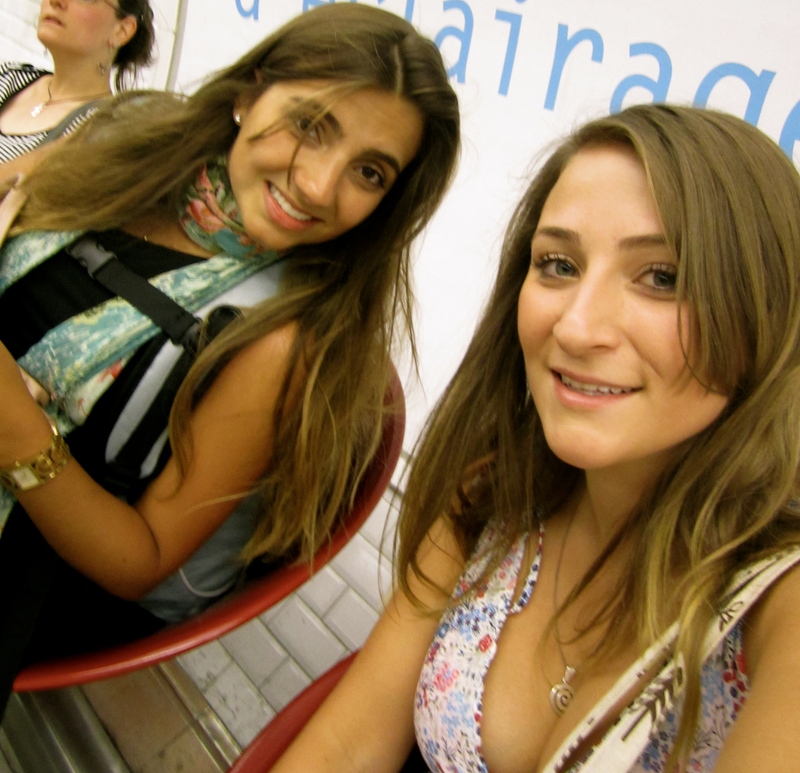 Me and my cousin, Ana,@some train station. The next day, Sam introduced me to his friend Tytti (I know….) from Finland! So we had something to talk about since I had just spent 10 days in Finland. Sam decided he wanted to make a Moroccan dinner for me and Tytti. He is from Morocco but has been living in France for years, with his brother. He no longer follow traditions like the Ramadan (Ramadan, the Islamic month of fasting, involves abstaining from food, drink, sexual relations, smoking and other vices between sunrise and sunset.). His mom, who was still back in Morocco, thought he did, so she sent him a few Ramadan sweets, that he could eat after sunset. We ate them fro breakfast, and they are DELICIOUS. Anyways, about the dinner. We invited Tytti to go to ”our” place the next day. Sam and I went to buy the ingredients and wine. There is ALWAYS wine, all the time, everywhere, for everything, in France. No need to say that I loved it. Tytti came over and we set the table in the living room, by the balcony, because, like me, Tytti also had a passion about the french balconies and she had noticed the smokers, too. 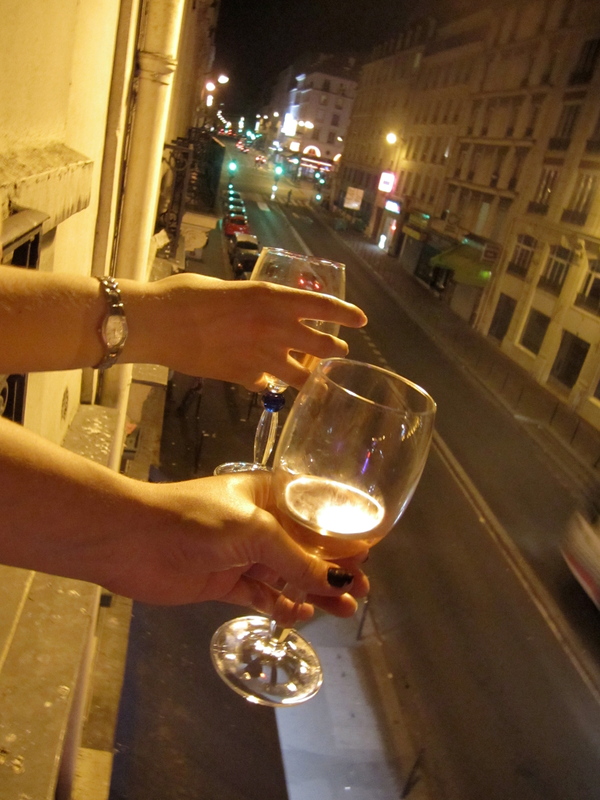 We decided we could stay in the balcony looking at Paris, for hours. Sam made this Moroccan chicken, and it was divine. I wish I had learned how to make it, but it took quite a while ot cook it, then all the spices etc….besides, I do like cooking, but he was the chef that night, so me my new finnish friend stayed out of the kitchen. Drinking wine and talking.